The main indication for CT of the spine is to confirm or dismiss suspicion of fracture e.g. in an ankylosed deformed patient. The images show a fracture which could not be detected with certainty by radiography (top left image), but is seen by 2D CT reconstructions (top right image) and 3D surface or transparent reconstructions (arrows). Such a fracture is instable and needs treatment. 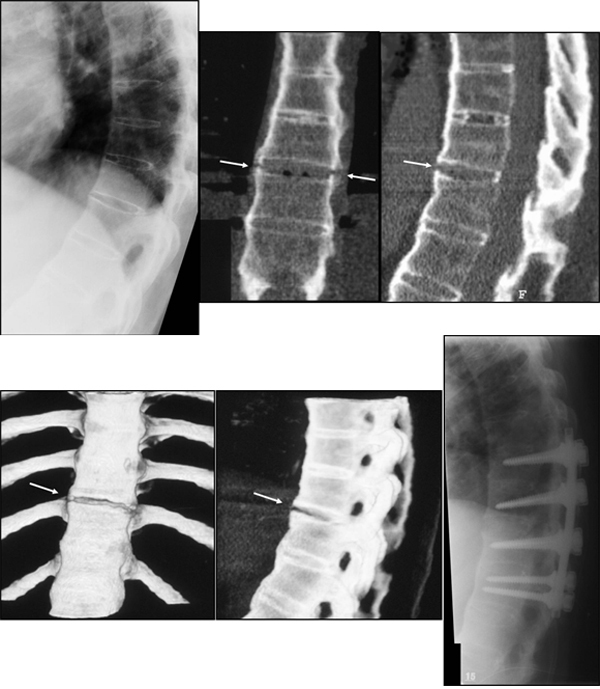 Surgical stabilisation is often necessary succeeded by radiography to confirm that the spine is properly stabilised (bottom right image).